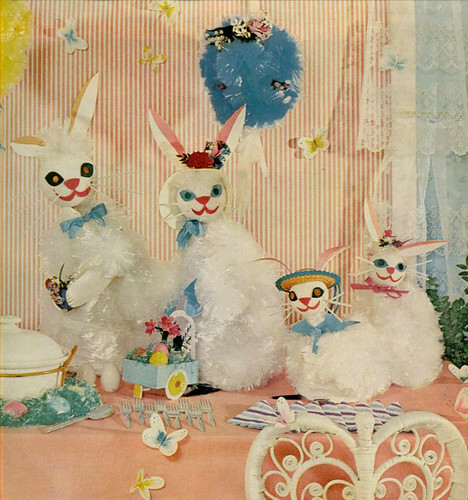 Today we are continuing our 3 part series on vintage Easter Crafts. 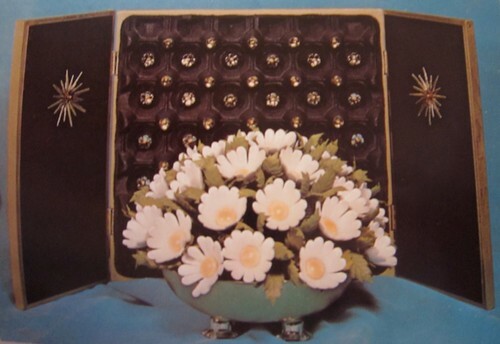 Have you ever noticed that it is always harder to find vintage Easter decorations? Actually it’s hard to find vintage decorations for most holidays except Christmas. 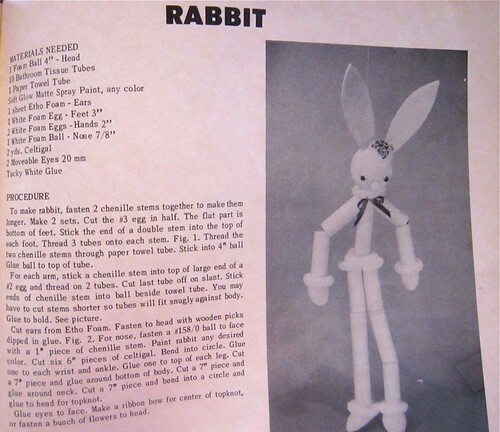 That’s why when I find a completed vintage Easter craft at a thrift store or flea market it is an extra special thrill for me! 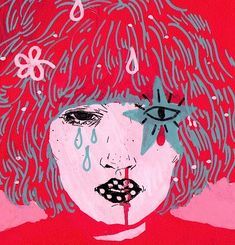 I’d kill to find a few of the goodies below. Camp Smartypants and I are both apparently connoisseurs of McCall’s Needleworks and Crafts Magazine. Is that bunny fur made of clear crumpled plastic bags? Even the Easter Bunny gets the cardboard tube treatment, no one and nothing is safe. Cardboard Tube Fun Ideas – A Craft “How-to” Create Book by Aleene is full of cute ideas. My guess is the Aleene behind this pamphlet is the very same Aleene behind Tacky Glue. Much like cardboard tubes, no craft is safe from yarn. 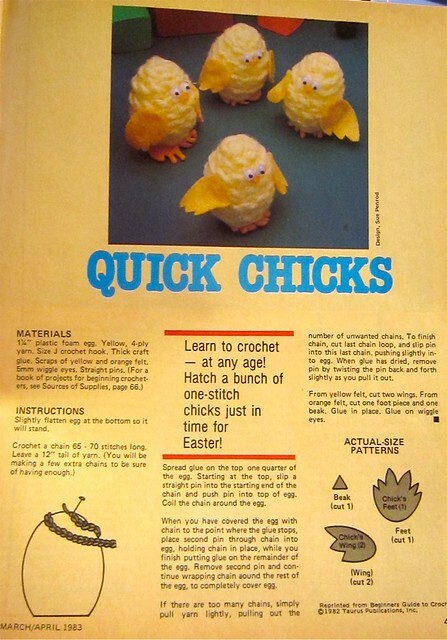 All these cute Easter critters make me want to brush up on my crochet skills. Thanks My Vintage Crochet Blog for the middle picture. 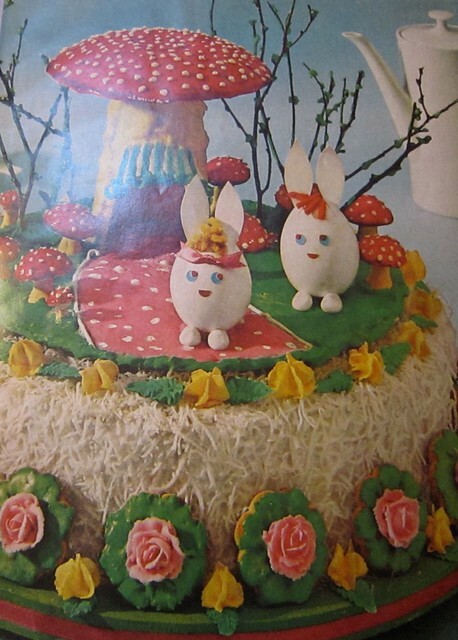 Is this cutest cake you have ever seen in your entire life or what? Think if you subbed in little garden gnomes for the bunnies. 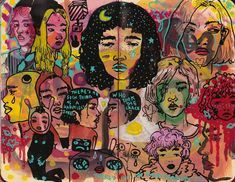 Like whoa. 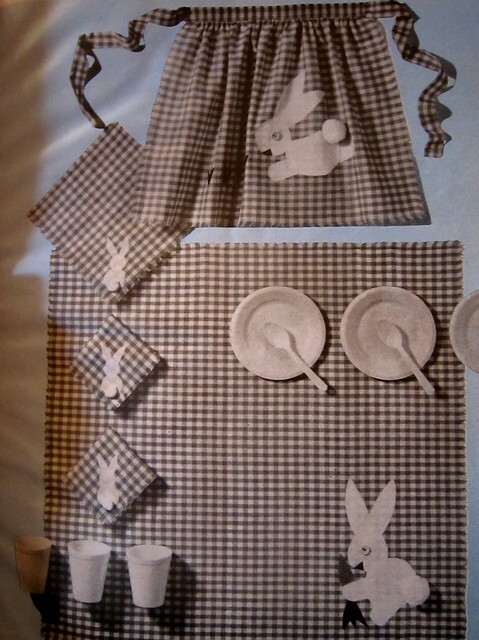 How about an Easter picnic complete with matching appliqued hostess apron, blanket and napkins. This is one of those pictures that makes me long for a color photo I’m just imaging navy gingham, bright orange felt carrots and vintage button eyes. 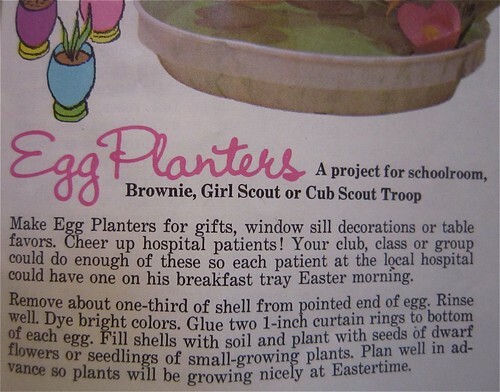 I love these little teensy tiny Easter egg planters. You could decorate your egg with a face and then grow grass out the top and have a Chia egg! I have to agree with Bacaorr that this is one of the Creepiest Crafts Ever. 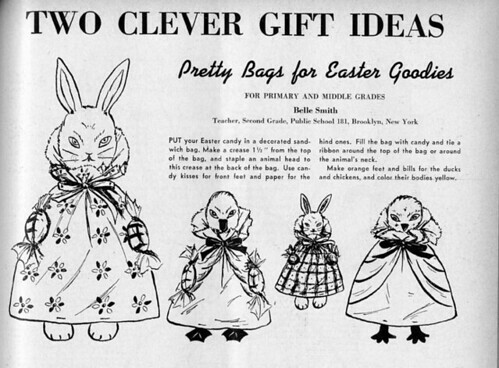 The bag idea is cute, but I might make my bunnies and chicks a little less diabolical. This awesome bouquet and shrine like backdrop are made of styrofoam egg cartons. They are enough to make me give up my cage free eggs in the cardboard cartons just for crafting supplies. 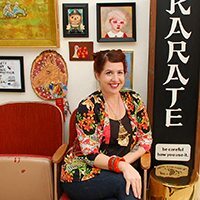 If you think these flowers are crazy, you should check out the peacock author Maude Savage makes. Posted April 13, 2011 & filed under Crafty, Easter. 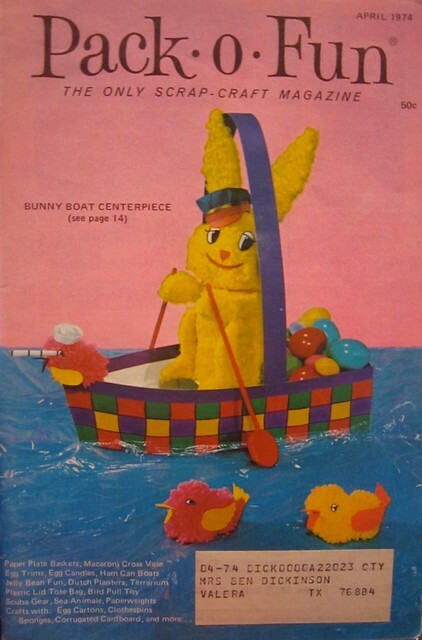 I also adore the cover craft of the fishing bunny!!!! I am overwhelmed with Easter Crafts. You have an extremely amazing way of putting your concept in post. 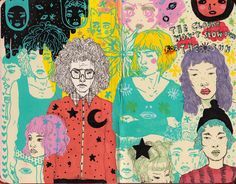 I am impressed with the presentation of your belief.